A stirring line-up of machinery was on display to support one of the country’s best loved faming competitions, which this year attracted more than 279,000 visitors to Ratheniska, Stradbally, Co Laois, over 23rd - 25th September 2014. Representing the New Holland brand among the 1,400 exhibitors were dealerships Adare Machinery, Murphy’s Motors Ltd and W.R. Shaw who each had stands offering a range of state-of-the-art products. On its stand, Murphy’s was showcasing the T6.165 and T4.105 tractors, along with its New Holland Based Tractor Puller owned and operated by salesman Darren Bailey. There were exclusive savings on deals made at the championships, including road tax paid for a year. Customers were equally impressed with demonstrations of New Holland’s satellite-guided Precision Land Management system, proving how its accuracy can save buyers money on seed and fertilizer. 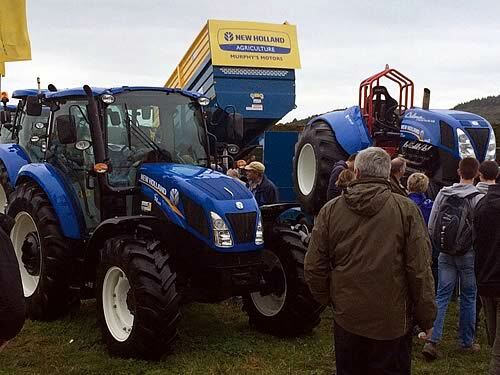 W.R. Shaw took the opportunity to display an extensive range of New Holland equipment, Tractors from the T4, T5, T6 and T7 ranges were on show throughout the event, along with a brace of balers, the classic BR6090 and the latest Roll Belt 150. Factory fitted loader packages were on full display on both the T5 and T6 tractors. Adare Machinery showed a full range of New Holland Construction equipment with Sales Manager, William Cuddy, reporting that the ploughing match was an important event as they are finding more and more customers using the range of Wheeled Loaders, Skid Steers and Backhoe coming from Agricultural applications, supplementing their already strong presence in the industrial sector.